This article will discuss (1) the REMS wind boom design, (2) at least partial malfunction on landing, (3) wind reports issued to the public, (4) history of wind measurement problems on Mars, (5) implication in terms of correct analysis of Martian air pressure, and (6) ultimately the credibility of NASA/JPL with respect to its overall portrayal of Mars and its history. UPDATE NOTE OF APRIL 9, 2014: In May of 2013 NASA, the REMS Team and Ashima Research all backed off their wind data claims and replaced them with N/A for MSL as we argued for below since 11/24/2012 on the DavidARoffman.Com website. 2. The Partial (or total) Malfunction on Landing. This section is lifted directly from Spaceflight 101. Our comments are shown in blue. The broken boom that looks to the side is Boom 1. In Section 1 above it was claimed that it hosts another set of wind sensors and (only) the ground temperature sensor. However, on Figure 1 above it is seen that Boom 1 houses both ground and air temperature sensors. Boom 2 only has an air temperature sensor (plus the relative humidity sensor) leading to questions about whether any ground temperatures published are correct. Click HERE to see MSL ground (and air) temperatures published by NASA. With one damaged wind sensor, teams will have to learn how to put the one remaining sensor to best use to provide wind speed and direction data to support the science goals of REMS." Note on August 13, 2016: Again, in fact, they never succeeded. Every single weather report by the REMS Team had listed the wind at 2 m/s from the east. They were all replaced by Value Not Available. Ashima Research, who drew its information from REMS, and used the metric equivalent of 7.2 km/h every day first withdrew its wind and daylength values, then pulled its website completely down. The REMS Team also list the relative humidity as -- or not available. Figure 3 below - REMS weather reports between August 29 and September 6 featured bizzarre pressure swings likely due to failure to make the right conversions between hPa and Pa pressure units, the wrong month on Mars, no relative humidity and never changing winds. The latter 2 problems persisted until May, 2013. As is discussed elsewhere, Ashima Research added to the problems by posting never changing sunrise and sunset times (always sunrise at 6 AM, sunset at 5 PM), but they also backed our calculations in 2013. 3. Wind reports issued to the public. Figure 3 shows the REMS Team weather reports issued to the publix between August 29 and September 6, 2012. They showed the same stuck wind speed until May, 2013 when they negated all wind speeds measured by MSL. Until then their 2 m/s figure from the east figure was nothing more than a (bad) guess. Schofield et al. (1997) indicate that while Pathfinder was operational from July 4 to September 27, 1997, it had no pressure data for the most crucial sol – its first operational day on Mars. The reason given by the above reference is there were “various spacecraft software reset and downlink problems.” If the problems only occurred after the first day and if the first day’s pressure data was consistent with the Vikings, then Pathfinder’s data could be used to refute the claims made in our report, HIGHER THAN ADVERTISE AIR PRESSURE. However, that is not the case. We are still dealing with a Tavis transducer with no way to keep the dust out of its pressure tube on or in the seconds before landing, and no way to change a clogged dust filter. The critical time is in the final landing process. So when the spacecraft has to reset the software and correct downlink problems then, the issue of exactly what is entailed in these corrections becomes one of extreme importance. An example of tracks being erased is shown in Figure 6 where Spirit’s tracks vanished during the 2007 global dust storm. Spirit landed at about 1.9 km below areoid. If the average pressure at areoid is about 6.1 mbar, with a scale height of 10.8 km, the average pressure at -1.9 km should only be about 7.27 mbar – quite low if wind is expected to move the sand. Unfortunately the rover carried no meteorological instruments. This means that it could not measure pressure or wind. However we can compare the time that it felt the dust storm to the time that Viking 1 experienced its two global dust storms in 1977 (see Figure 26 from our Basic Report HERE). We could also look at what happened to Viking 2 then, but both MER Spirit and Viking 1 were in the Martian tropics while Viking 2 was at almost 48° North. As such, it is appropriate to examine the winds experienced by Viking 1 during dust storm 1977a, which began at Ls ~205, and dust storm 1977b which started at ~Ls 275 (see Figure 26 from our Basic Report HERE). Note – both Vikings landed at an altitude about 3.5 km below the areoid. Identical winds at Spirit, about 1.6 km higher, would be less able to move sand. Figure 6 - NASA asserts the presence of dust devils at Gale Crater. 5. MSL Dust Devil Assertions. NASA published the chart and assertions made on Figure 6 in reference to whirlwind detection by at Gale Crater HERE. The issue is whether their interpretation is warranted or not. The first thing noticed is that the winds are shown as being largely from the north, whereas every single REMS and Ashima report from August 22, 2012 to January 7, 2013 shows an average wind at 2 m/s from the East - with no variation whatsoever. Next observe that the overall drop in pressure from 11 a.m. to 11:15 a.m. (about 2 Pa) is more than the drop in pressure at about 11:02 a.m. (about 1 Pa) that is supposed to be associated with the first dust devil. Also, the wildest gyrations in wind direction at 11:10 is not associated with any kind of significant pressure drop that minute. At a few seconds before 11:11 a.m. there is another almost as large change in wind direction that is associated with a pressure drop from about 779.6 Pa (7.796 mbar) to about 777.25 Pa (7.7725 mbar). How do the pressure fluctuations seen at Gale Crater compare with dust devil pressure variations seen on Earth and with hourly pressure variations seen with the Viking landers on Mars? Roy E. Wyatt (1954) of the Weather Bureau Regional Office in Salt Lake City, Utah reported that a small, approximately 50-foot high, 50 to 60 foot wide dust devil had its center pass within 8-10 feet of a microbarograph on August 12, 1953 in St. George, Utah (Figure 2) at an altitude of 2,951 feet above sea level. A drop from 26.98 inches of mercury (913.644 mbar) to 26.94 inches of mercury (912.289 mbar) was recorded. This 1.355 mbar drop in pressure equals 133.5 Pa (compared to a 2 Pa drop with the alleged dust devil at Gale Crater). However, most telling is that Viking 1 and 2 almost always saw much larger pressure increases each sol about 7:30 AM local time with increases up to 0.62 mbar (62 Pa) from the previous hour at that time. This is discussed by us in more detail in Section 1.1.8 (Core Pressure Excursions) of our Basic Report. So, in summary here, the wind directions offered by NASA match nothing seen in their daily reports over 5 months of MSL operation, the pressure drops are not there for all the wind gyrations seen, and of course the amount of pressure drops neither match what is seen on Earth with dust devils, nor the approach what is seen in hourly pressure fluctuations reported by the Viking landers. Finally, no dust devil was photographed in asssociation with these pressure drops at Gale Crater. Figure 7. Spirit�s tracks vanished during the 2007 global dust storm. 6. Implication in terms of correct analysis of Martian air pressure. Figure 7 is useful in understanding the main problems at hand. Sand moves on Mars much more than it should at the NASA-advertised pressures. Update of April 26, 2017: Click here at https://mars.nasa.gov/imgs/2017/02/mars-wind-sand-movement-pia21143-full.gif to see how sand moved under the MSL Curiosity between January 23 and January 24, 2017. Dust devils are abundant on Mars despite the fact that NASA could not replicate them at 10 mbar in a wind tunnel at Ames unless it used winds higher than any ever seen on Mars and more than 11 times higher than Martian winds typically seen. JPL's latest attempt to explain the failure of its chosen wind sensor relates to rocks that were kicked up by the rocket engines hitting Boom 1. 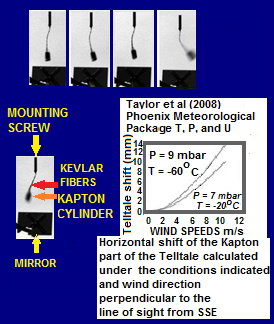 On Phoenix NASA couldn't afford an anemometer even though the MET package cost $37,000,000. On Pathfinder they couldn't calibrate the anemometers (to do that it really helps to have the air pressure measured correctly), and NASA had a computer problem and couldn't do that on the all-critical first day on Mars. So, after the 1976 and 1977 landings on Mars, when no movement of sand was reported seen at Viking 1 or 2, all we really have for measured wind speeds are from Viking 1 and 2. If someone wanted to sabotage the truth about the real nature of Mars, they would do well to allow the wind booms on MSL to be destroyed. Why were they not shielded? The first picture ever taken from Mars showed rocks kicked up and sitting on top a lander footpad. The paper REMS: The Environmental Sensor Suite for the Mars Science Laboratory Rover by J. Gómez-Elvira et al. (2012) lists one of its authors as Kahanpää. He was a designer of the FMI's Vaisala pressure transducer. When we wrote to him about his complaints about not being given critical information about heat sources during the design phase of the Vaisala (used again on MSL) due to ITAR, and about not knowing about air access tubes to the dust filter for his sensor, he indicated that the Mars Science Laboratory (MSL) is a $2 billion (actually. $2.5 billion) cornerstone mission and it is therefore handled in a different way than the $454 million dollar scout mission Phoenix. But apparently not different enough to fund boom protection. In the end if the moving sands (and weather) of Mars point to higher pressures than advertised by NASA, the question must be asked, "Did NASA get Mars wrong due to incompetence, or did it choose to hide the truth for fear of cultural impact?" The REMS Team has published weather reports that contain numerous goofy mistakes. This is shown on Figure 3 above. But it's hard to believe that the people on the REMS paper can all be incompetent. What organizations are they associated with? A partial list includes the Centro de Astrobiologia in Madrid, Spain. They had oversight over REMS and publish the daily weather reports. I discuss Ashima Research in conjunction with their flawed Ashima/MIT Mars Generation Circulation Model (GCM) elsewhere on this site. I was only motivated to check on their GCM when I noticed a pattern of sloppy reports that are discussed in my article about them. One of their members was from MIT. JPL, the FMI (who created the pressure sensors), NASA Ames, Michigan Unversity and three Spanish universities had authors on the paper. While incompetence is possible, disinformation cannot be ruled out. This will be discussed in Section 7 below. 7. Statement by David Roffman on credibility of NASA/JPL with respect to its overall portrayal of Mars and its history. Seven years ago I was just beginning my B.S. in space physics at Embry-Riddle Aeronautical University. Now I have a PhD in physics from at the University of Florida. Back then I had an assignment to write a paper for a 1-credit Introduction to Space Science course. I asked my father if he had any ideas for a topic. He suggested that I look at the issue of how dust devils could form on Mars with an average pressure of 6.1 mbar at areoid. I've long viewed dust devils as the Achilles ' Heel of accepted Martian pressure. The initial reaction of my professors was one of certainty that accepted pressures were correct, but as I brought in more contradictory evidence, I saw them in private begin to express the possibility that I might be on to something. The more I checked out the details, the more we suspected that our Government might be giving us a snow job about Martian air pressure. In fact, we even discovered that snow was seen falling at the Phoenix lander, although this was supposedly not unexpected. When my father suggested the topic, it wasn't out of simple Curiosity (for which the MSL rover is named). It was because he suspected that truth about Mars was part of a larger truth that has been covered up since 1947. In the Basic Report, as has been discussed somewhat above, we provide the results of interviews with Professor James Tillman, Director of the Viking Computer Facility; Henriq Kahanpää who designed the Phoenix and MSL Vaisala pressure transducers, a sales representative for Tavis who gave us the CADs for the Vikings and Pathfinder; the historian at the NASA Ames facility. Elsewhere on this site I present the debate results (see http://davidaroffman.com/photo4_5.html) between us and Dr. Andrew Ingersoll at Cal Tech/JPL. He is shown on a history chart (see http://davidaroffman.com/images/fig_35_history.png) as having professed a surface pressure on Mars of under 10 mbar back in 1969. Twice in 2011 we spoke with Dr. Ashwin Vasavada, Deputy Project Scientist for MSL. We have read countless papers, and I feel almost like I’ve lived on Mars after reviewing each of the hourly pressures, temperatures and winds on the two Viking landers for many hundreds of days. I can assure you that the same effort made to interview everyone alive who played a major role in establishing accepted pressure on Mars, was also made by me to interview people with personal, technical and professional knowledge of what I will only refer to here tangentially as the larger truth. I have many friends who have shared sensitive information with me. Much of it cannot be published because of the effects it would have on careers, or more. But all of it points to a pattern of deliberate disinformation. Some of the deception is, at times, removed. We now know that the color of the Martian sky, as seen by MSL, is indeed blue although originally when people like Dr. Ron Levin saw that blue sky on their monitors at JPL, it was manually altered to a redder color. He fought that act for over 30 years; with his last paper about it HERE (http://www.gillevin.com/Mars/5555-29.PDF). His father, Dr. Gil Levin, was told by NASA that there were no organic chemicals on Mars, but that has recently been proven false. We think that Dr. Gil Levin should have won the Nobel Peace Prize for proving via his labelled-release experiments on Vikings 1 and 2 that there is life on Mars now. My article about Dr. Levin is at http://davidaroffman.com/photo2_25.html. Obviously, now that we know there is running water on the surface of Mars, our belief that there is life there is even stronger. We were told after Viking that there is no movement of sand on Mars, and that too (as was discussed above) has been proven false. But the pace of these recantations is too slow. Based on over seven years of intense Mars research, and a huge number of interviews, it is my judgment that the first act of deception with respect to wrongly portraying the color of the Martian sky was part of an overall attempt to keep us from sending people to Mars. Here I digress briefly. If I were naïve, I would call for a Congressional inquiry into how data from Mars has been handled. But we live in an age when people are deceived by our Government over matters as simple as whether the attack against our consulate in Benghazi was linked to a cheap film about Mohammed, or whether it was an attack by Al Qaida which could cause political damage to the Administration. We live in an age of political spin, and news networks that spout the Government line. Perhaps one day there will be people colonizing Mars, and they will know the truth. If there are, I hope they look back at our findings here and remember the efforts that we have made to open a new world for them. UPDATE OF MARCH 2, 2017 BY BARRY S. ROFFMAN: President Donald Trump's vision for America may include landing astronauts on the moon or Mars by the mid-2020s, if his first address to a joint session of Congress is any guide. "American footprints on distant worlds are not too big a dream," the president said during his Tuesday night (Feb. 28) speech. I note a large and significant increase of Department of Defense (DoD) traffic to this site (and this page) after those remarks were made. Whether by a private SpaceX rocket or by the U.S. Space Launch System, let me assure my DoD and SpaceX readers that I am ready to offer whatever assistance is useful to making these missions a success. I do not require a salary if the work can be done near or where I live in Cape Canaveral, Florida. As for my son, David, currently serving in a postdoc position at Yale, his preference is that if employment is offered in conjunction with such a mission it be near our home in Cape Canaveral. We all look forward to the upcoming launch of the SpaceX Falcon Heavy which is supposed to take two tourists around the moon by the end of 2018. And we are thrilled that we may get to witness from our front door not only the return of Americans to the moon and possibly Mars in my lifetime (I'll be 70 on May, 2017), but also the revelation of the truth. When NASA is ready to reveal the truth, we are ready to help explain it.